Weighty Matters: Resolution Series Day 1: Like Em! Yes, I'm Jewish, but that's not going to stop me from glomming on to the "12 Days Of" theme. This one's pretty straight forward, and pretty darn easy too. Simply put? For any of your coming year's resolutions or lifestyle interventions, resolve to only start ones that you think you'll actually like. Too many people make far too dramatic, broad, general, or strict resolutions, and are then surprised when a few months later, their resolutions are barely a memory. It's this phenomenon that pays the bills at every gym in the world - people take a flying leap at a far too aggressive and/or time intensive program and surprise, when they get sick of trying to bite off more than they can chew, they stop chewing. Weight wise, the more weight you want to permanently lose, the more of your lifestyle you're going to have to permanently change. Trying to adopt changes you don't like is a sure fire way to ensure that they're not going to be permanent. So this year, resolve to like them. 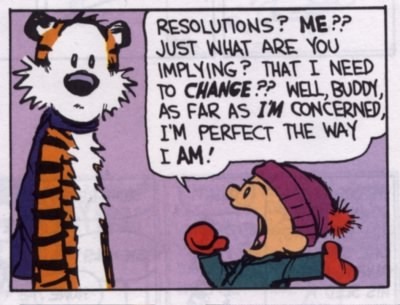 Analyze each and every resolution through the lens of, "Can I keep happily keep living this way"? Because if you can't do it happily, you're probably not going to keep doing it.